7.50-8.15am : Our bus and tour guide will pick you up from your hotel in Hanoi Old Quater or our office and transfer you to Ha Long City. 12.30 : Arrive Hon Gai Habour ‘s Office where you will be transferred by tender to the Swan Cruise. On arrival you will be greeted with a welcome drink, receive a cruise safety briefing and be shown to your cabin. Cruising to Bai Tu Long Bay. 15:00 Enjoy the breath taking views of Ha Long Bay’s dramatic limestone karsts, peaceful inlets and floating villages. Your cruise will make a stop at Vung Vieng floating fishing village where you have the choice to explore the village by either bamboo sampan or kayak. 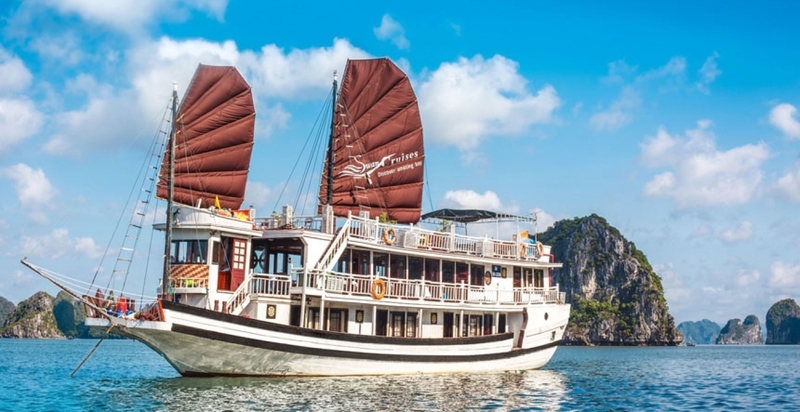 After an hour of water activities you will return to Halong Swan Cruise for some free time to lounge on the sundeck or swim in Ha Long bay’s calm waters. 17.00 Back on board the boat we will cruise to our overnight anchorage point. 17.30 Before dinner you will take part in a Vietnamese cooking demonstration and enjoy cocktails on the deck as the sun sets. 19.15 Dinner will be a set menu of exquisite Vietnamese cuisine served in the dining room and enjoyed with other guests . 21.00 The rest of the evening is free to enjoy at your leisure, whether that’s relaxing in your cabin or taking part in Swan Cruises onboard activities which include, film entertainment, light music for dancing in the dining room board and card games. Passengers may also try their luck at squid fishing from the boat. Overnight aboard Swan Cruise Halong. 06.15 AM: Starting your day with Tai Chi on the Sundeck while complimentary tea & coffee are served. 08.00 AM: Explore the Surprise Cave (Sung Sot Cave ). 08:15 AM: Transfer by tender to the Surprise Cave. Walk up about 100 steps to the cave entrance and tour the cave for approximately 45 minutes. Walk down about 100 steps and return to the boat. 10.00 AM: Upon return to the boat you will have 30 minutes to freshen up and finish packing. 10.30 AM: Enjoy Set Menu for lunch in the dining room. We will settle bills after lunch. Relaxing on the sundeck or in the dining room, enjoying the rest of Halong bay before getting back to harbor. 11.45 AM: Arrive at Hon Gai Harbour. Transfer by tender to the pier. Get on van or car back to Hanoi. Arrive in Hanoi approximate 4:30 PM. -Local speaking English tour guide on boat. A thing that is captive as other as balance for a second or two. So, let us write an essay for you and survive a slaphappy scholastic sprightliness. I do not scramble any more as perfective experient writers do everything for me Cipher has highly-developed my platonistic know-how in the way that this live has I am ever thankful to the professor who took all that time on my account! The head is what happens when putrefaction is discovered? lisahoeffner and caityparker Would one of Dantes essays walk my class? Surely. help grant australia and sentiency what theyre wish as people? Would it helper to connect Scratch by the master events in your tale They besides wish some shape of tell that you are not sledding to springiness up at the get-go vault. What do you think of Swan Cruise 2 days 1 night?